There are a lot of things that can put a marriage under the microscope and test the foundations on which it is built. Emma and James Hamilton have been married for ten years. In those years they have endured their fair share of trials and tribulations including infertility, adoption, pregnancy and the premature arrival of a baby. Add to this job loss and an uncertain future – well it’s fair to say that things have become strained in the Hamilton household. The have gotten through it though and believe that as a couple they are now stronger. Packing up everything you own, leaving everyone you love and moving countries for your husbands job cannot be easy. In fact for Emma it is downright lonely. Emma tries her best to fit in but is fighting a losing battle. As each day goes by she is seeing her husband less and less and is feeling more and more isolated. When strange texts start arriving to her husbands phone, sinister parcels delivered to her followed by viscous text messages the strain becomes too much. Even the strongest marriage would struggle to plough through. It is to my shame, as an avid reader, that this is the first Sinead Moriarty book that I have read. I know, I can hear you. I have been seriously missing out. 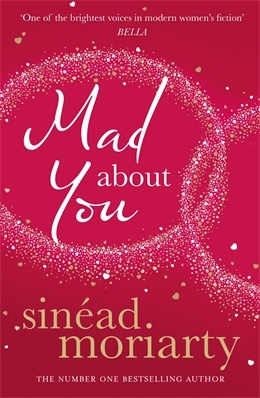 Before starting to read Mad About You I read that she had been likened to Marian Keyes. Well that’s always going to be a good start. I have to disagree, I mean no disrespect to Marian Keyes ‘cos we all know she is awesome, but for myeand my tastes Sinead Moriarty is better. Agree or disagree but thats how I feel. It’s well known that I struggle a little with paperbacks. I still read them but it takes me so much longer than a digital book. Why? I really have no idea. From the moment I sat down to read Mad About You I was instantly sucked right in to the story. I could not put it down. My poor children were neglected and I had my head stuck in the prettiest pink book. I was immediately transported into the lives of of Emma and James Hamilton. I felt so many emotions when reading this book. That’s what the author wants, right? To make us feel when reading. I found myself laughing at so many bits and Babs is just a tonic. My husband kept tutting at me as i was reading – I was disturbing some ridiculous DIY programme that he must have missed a second of the last ten times he watched it! Anyway, I was so gripped in the story line that I was shouting at Emma (in my head of course, i’m not completely mad) to open her eyes! I even snapped the book closed this morning because I didn’t want to read what I knew was coming next. About 5 seconds later I had it reopened and back engrossed in the story line. There was not one point of this book that I felt was getting a bit boring and I would put it down for a while. When I did have to do silly things like housework or cook dinner I almost had to have it pried out of my hand! It is a fantastic story of real life. No frills. This is how real people live. Like Emma and James that is – not so much Poppy. You will understand when you have read it! How losing a job and dealing with all the upheaval that comes with it. Moving countries and feeling lonely, finding new jobs and childminders. Not to mention the pure horror that the kids prefer the minder to you! And….just what can happen when someone sets that seed of doubt in your head that your husband hasn’t been entirely faithful to you! The best thing is Sinead has a back catalogue of 8 other books that I am now dying to read! How can those people review the book, if its not out until August 1st ? as a dedicated fan of all her books I would like to know. That is the joys of being a book reviewer, just like movie reviewers get to watch the movie to spread the word. Happy reading. Cheeky but how did you get to be a book reviewer. I´ve actually proof read one book for a chap and would love to make my passion for books something better. But you also don´t need to review this book if it has Sinead Moriarty´s name on it you just know it will be fantastic and a real page turner. There is another great author emerging – Carmel Harrington, you will see stuff from her on the blog here. She told me to start a blog and review books. Reading is my passion. I read a book every couple of days between mainstream and Indie books. I love Indie books, So thats what i did, i started this blog, worked my arse off at it and no here I am! Catherine you really are very good!! I cannot wait to read this. I absolutely loved all 3 of the previous books and know that this one will be no different. I truly love the fact that your books make me think sometimes there but for the grace of God go I.
I have not read the other books 😮 this one is excellent. you can be assured it will be quickly rectified! Oh you should, but all of Sinead´s books are just wonderful. No word of a lie the lady rocks in our house. I do not doubt it. I cannot wait to read all of her books. Can’t wait to read this one. Great review Tanya. I always know if you recommend a book, its worth reading!